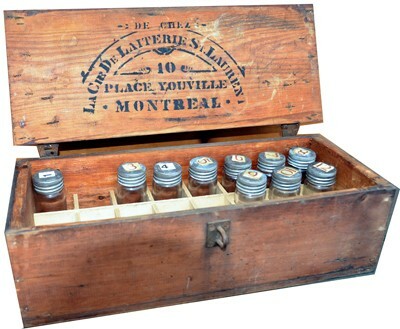 Searches in Montreal Lovell's directories : La Cie de Laiterie St-Laurent F. X. A. Trudel, Manager, 21 St-Peter St. Montreal (1907-1917). After 1917, it looks like the Company quited Montreal to show up in Ville St-Laurent, 33 St-Mathieu St. (1927 - 1931). Address in Lovell : 33 St-Mathieu St. Ville St-Laurent. 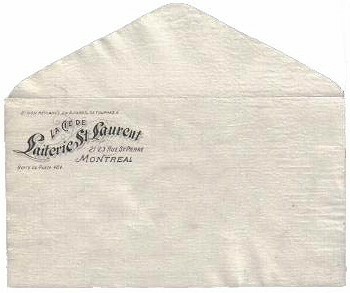 In 1924, St-Peter St. is renamed St-Pierre St. As we can see on the enveloppe, the Dairy already started before 1924 to use the french name. The address on the enveloppe is the last address known of this Dairy in Montreal. In 1917, it's the " The De Laval Co Ltd Dairy " that came to occupied this address.